Learn about the wonder of robotics with the 4M Table Top Robot. 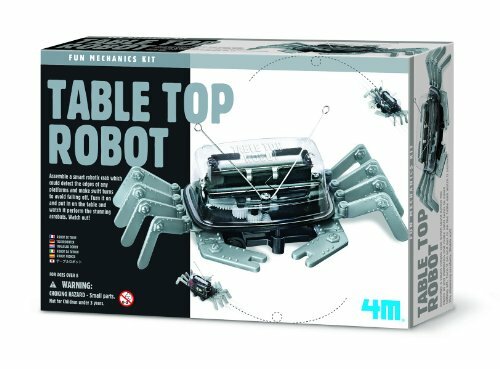 The Table Top Robot is a hands-on science kit that teaches the basics of robotics by constructing a working robot crab. When activated, the robot crab scuttles under its own power and changes direction when it encounters an obstacle. Place it on a tabletop and watch it perform acrobatic tricks. No special tools or knowledge required; the kit contains detailed instructions and all the necessary parts. Requires one AAA battery (not included). Recommended for ages 8 years and up.